Every Question You Have About Painting Your Radiator, Answered. — Trim Design Co.
Every Question You Have About Painting Your Radiator, Answered. Life’s too short for boring, grungy radiators. That’s why I’m sharing all the intel you need for a DIY radiator makeover! Keep scrolling for my simple how-to guide plus a round up of my favorite painted radiators to get your inspo on! Can I just say that this is an old picture and the messy utensil crock full of colorful plastic just slays me (I’ve been purging our house of plastics and chemicals), but I can’t be bothered to clean and reshoot the kitchen right now, so here it is in all it’s brutal realness. 1) First order of business is cleaning the radiator, because painting on a dirty surface doesn’t work so well (duh). So give that baby a serious wipe down! Isn’t she cute in her LBD? For reference, I went with a flat finish here and I’m very happy with it. Don’t forget to tape the knobs before painting! 3. Before you start painting, there are a couple key steps to prep the area. Open the windows for plenty of ventilation (this is not optional; your lungs and central nervous system will thank you!). Paints and cleaners are full of chemicals and proper ventilation is a serious matter. My father-in-law used a strong boat cleaner without proper ventilation and he lost most of his sense of smell as a result! Use plastic trash bags or newspaper and painter’s tape to completely cover the surrounding floor and wall. Cover more than you think you’ll need to because the fine mist of spray paint can really travel and you don’t want to get stuck repainting walls at the end of this! Make sure your radiator is OFF for the duration of painting and drying! This is a great summertime project, although I’ve done it in winter too. This is what my feet looked like after painting, even though the floor looked clean! That super fine paint mist can be sneaky! Contrary to what you may hear or read, you do not need to use special high temperature paint because traditional residential radiators don’t actually get hotter than a couple hundred degrees. 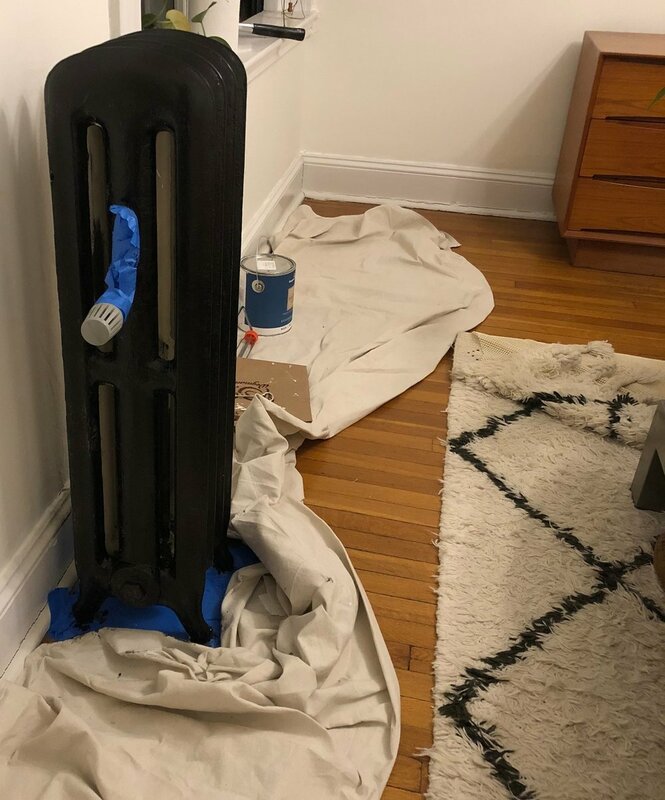 If you have cast iron radiators, putting latex based paint directly on them can cause rust, so start with Rustoleum Red Oxide primer in the spray can if your cast iron radiator is naked. I didn’t use any rustoleum primer on my cast iron radiators, but I left the previous paint on and just sanded it a bit (after testing for lead to be safe) before spraying on a paint-and-primer-in-one and I’ve never had any rust issues. Opt for a spray paint that includes primer unless you’re using the Rustoleum spray-on primer first. Check the label on the can to ensure it’s safe for use indoors. There’s a heated debate about oil versus latex based paint for radiators. Technically latex isn’t as durable, but I’ve never had any issues with it when used on top of an older coat of paint. Maybe that’s because I’ve used latex spray paint that includes primer. So really the choice is up to you, and depends on the state of your radiator. The spray paint can take a couple of days to finish outgassing once the heat comes on, which basically means it will give off an especially strong new paint smell, but this is not harmful according to the can label and a few handymen I’ve spoken too. If you have a baby and you’re worried about this, please get a second opinion rather than take my word for it.